Healthcare services target delivery of a connected patient journey as an indicator of a high quality of care, but knowledge of the patients’ experience is sparse. 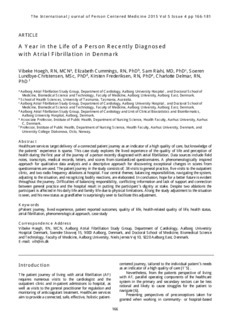 This case study explores the lived experience of the quality of life and perception of health during the first year of the journey of a person recently diagnosed with atrial fibrillation. Data sources include field notes, transcripts, medical records, letters, and scores from standardized questionnaires. A phenomenologically inspired approach for qualitative data analysis and a descriptive approach for discovering exceptional changes in scores from questionnaires are used. The patient journey in the study consists of; 38 visits to general practice, five visits to the outpatient clinic, and two radio frequency ablations at hospital. Four central themes; balancing responsibilities, navigating the system, adjusting to the situation, and recognizing bodily reactions, are elaborated. In conclusion, hope for a better future is evident throughout the journey. Difficulties of balancing responsibility, conflicting information and lack of support and connection between general practice and the hospital result in putting the participant’s dignity at stake. Despite two ablations the participant is affected in his daily life and family life due to physical limitations. Along the study adjustment to the situation is seen, and his new status as grandfather is surprisingly seen to facilitate this adjustment.